Preheat oven to 350F degrees; grease and flour a 9 inch round cake pan. For CAKE cream butter gradually adding the sugar. Add egg yolks and 1 egg to creamed mixture beating well. Combine 1 cup of flour and baking powder and sift. Add flour mixture to creamed mixture alternating with milk mixing after each addition. Pour batter into prepared cake pan; bake about 25 to 30 minutes or until pick comes out clean. Cool in pan 10 minutes; remove from pan and cool completely. For FILLING combine egg yolks and water; set aside. Combine ¾ cup sugar and 1/3 cup flour in a heavy saucepan; add egg yolk mixture and lemon rind. Cook over medium heat stirring constantly until mixture thickens and comes to a boil. Boil mixture 2 minutes and remove from heat; stir in lemon juice and 1 tablespoon butter. Cover mixture with wax paper and cool. Place cake on baking sheet; spoon filling onto cake. NOTE: To be able to move the cake to a serving plate when completely finished, place a piece of parchment paper under the cake on the baking sheet. Cut the parchment paper slightly larger than the cake to prevent the meringue from sticking to the tray (it will bake on the parchment paper). When the cake cools, use a cake lift or spatulas to lift it to the serving plate. For MERINGUE beat 4 egg whites (at room temperature) and cream of tartar at high speed 1 minute. Gradually add ½ cup sugar, 1 tablespoon at a time beating until stiff peaks form. 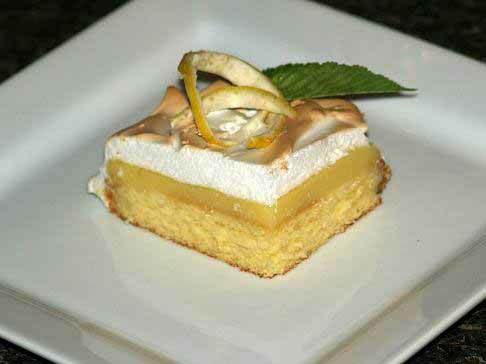 Spread meringue over lemon filling; bake for 12 to 15 minutes until meringue is lightly browned.